Idaho’s Snake River system is no secret, but it is often overshadowed by other fishing spots in the area. This rings especially true for the river’s mainstem in Idaho. Big water means big fish, but casting into larger rivers can be intimidating on first glance. Large trophy trout flourish in several different environments—and the Snake is one of most reliable for landing a prized catch. There are only a few incredible gems like the Snake, with the biomass to regularly produce large fish in a diverse ecosystem. On the Snake, you can fish the Henry’s Fork Box Canyon for bruiser tailwater trout, the South Fork for some of the largest cutthroats in the west (with a nice mix of healthy brown trout), or you can scour the mainstem for that rare trophy brown, rainbow, or cutthroat that are rarely caught. The Snake River system in Idaho offers everything from ultra-selective dry fly fishing to big streamers in big water, where every cast has the potential to move a wild monster. Dumping out of Henry’s Lake at Island Park, Idaho you will find the Henry’s Fork of the Snake. The short box canyon stretch located immediately below the dam is jam-packed with trout, and every year anglers reel in fish measuring more than 24 inches. Wade access is easy right below the dam by using the boat launch access site. Floating the canyon is also a popular way to spend a few hours. To make this float last half a day, you really have to back row or wade while holding the boat back. After the Box Canyon you’ll encounter the Railroad Ranch stretch which is wade-only. The river looks and acts like a big spring creek with extremely challenging and selective trout. Bring your best midge and mayfly patterns for this area and make perfect presentations. It’s a challenging and rewarding piece of water. It’s also popular and busy in the summer months, making it a prime candidate for a shoulder-season trip. Fall is prime time, when the crowds dwindle and big brown trout begin moving more aggressively before the spawn. Below Railroad Ranch the river has great volume and some beautiful water for floating or wading. It has that difficult element where you can find pods of 16-inch trout feeding on top, but you also know running a big streamer could produce a much larger specimen. Bring a few rods rigged with streamers and dry flies, and make that difficult choice when you hit the river. 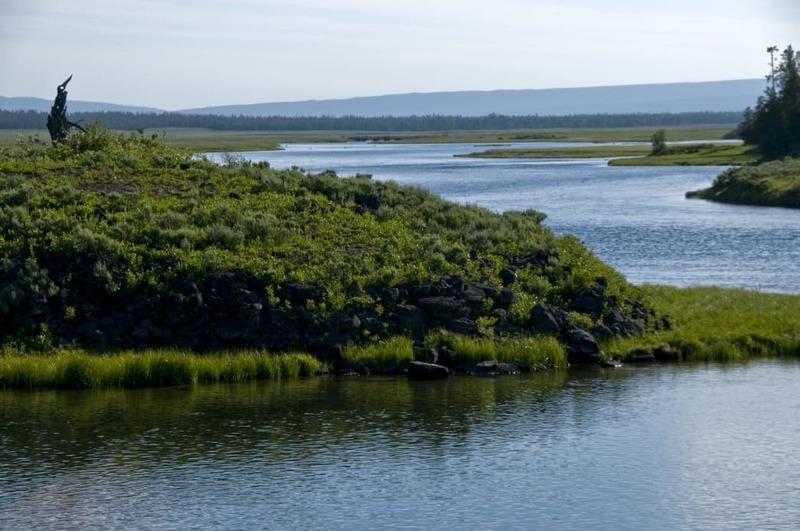 Warm Springs to Ashton is a great choice for fishing around here in the fall months. Like the Henry’s Fork, the South Fork begins below a dam, but it has that hybrid characteristic of a tailwater and freestone fishery. Flowing out of Palisades Reservoir on border of Idaho and Wyoming, the South Fork is a major attraction for anglers seeking dry fly bliss during the summer months. Acting as one of the healthiest cutthroat fisheries in the West, the South Fork is no secret, and it offers both float and wade fishing opportunities. 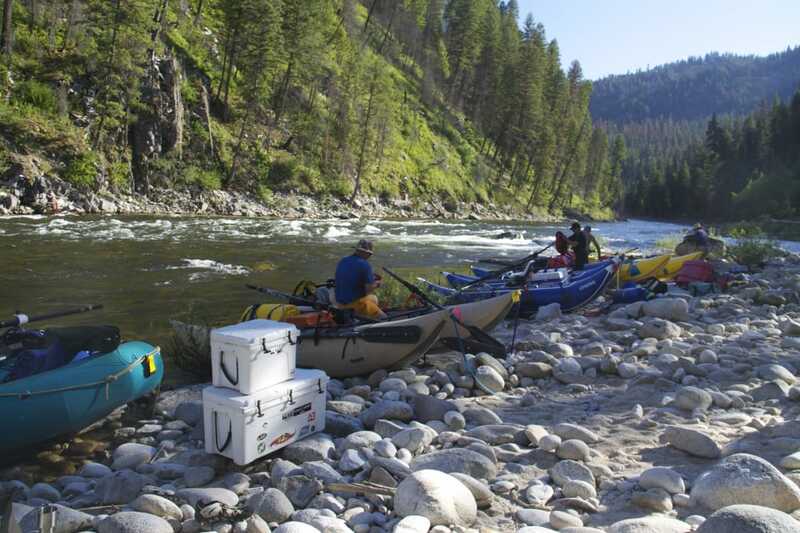 To really tap into the potential of this river, you should fish from a drift boat or a raft. Most anglers head to the South Fork for the world-class dry fly fishing for cutthroats, but approaching the river with the intent to target larger fish during the spring and fall months can sort out the bigger fish. And, there are some seriously big brown trout and even cutthroats that reach abnormal sizes in this river. During the prime summer fishing months, the cutthroat population is often readily competing over your fly, and these bigger fish are not seen. The 64 miles of water below Palisades Dam make this less like a crowded tailwater and more like a long drainage with room to explore on foot and by boat. The Henry’s Fork and South Fork join to form the Mainstem Snake River. Far less popular than either fork among fly anglers, the Mainstem is a unique, large volume fishery with a much different dynamic than it’s contributing sources. 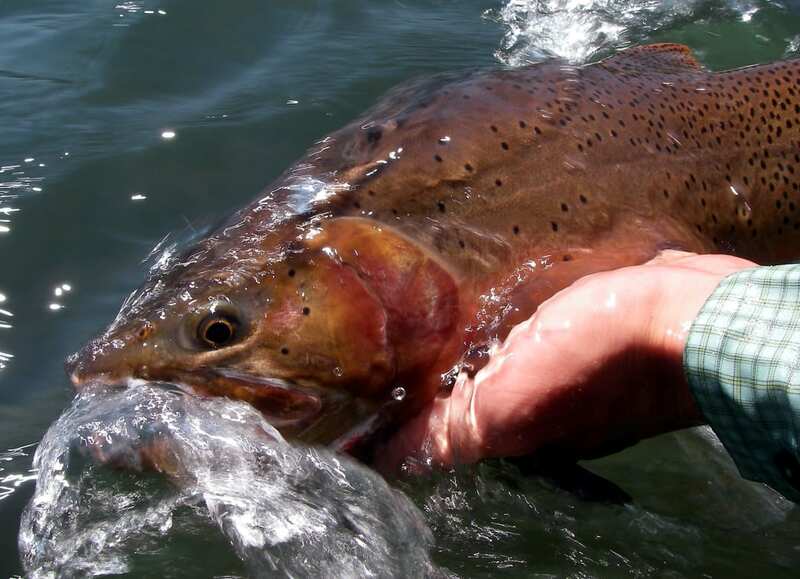 Although less popular, this should not be overlooked as it produces some of the Snake River system’s largest trout. It also has a hatch of giant Hexagenia mayflies (unknown to many anglers) during the fall months. This hatch is comparable to salmo flies on the upper reaches, as it lures the largest trout in the river to a dry fly. 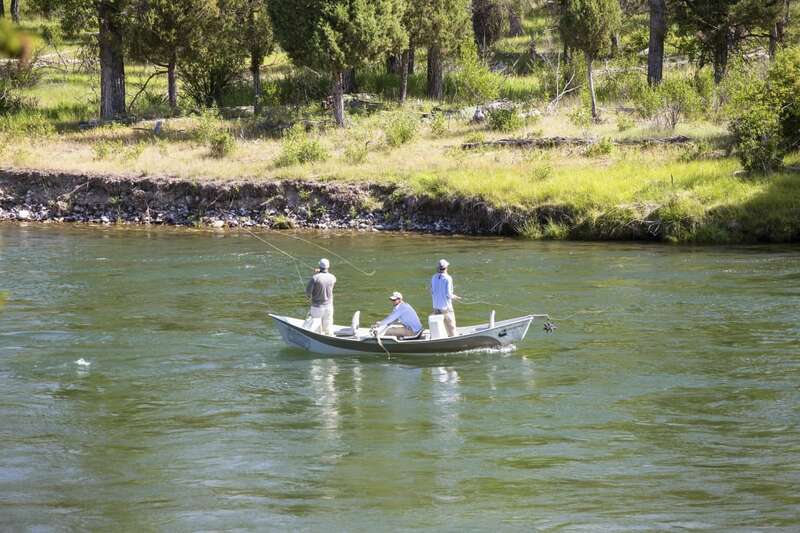 The main river experiences fluctuations from irrigation drawdown, and some of the most consistent fly fishing occurs during spring and fall when the irrigation lines are shut down. Consistent flows encourage access from jet and drift boats. Wade fishing is also possible, but much of the river runs through private land, and boats simply provide access to more water. Also, boats allow you to cover longer stretches and really search with streamer patterns. The entire river, from the confluence to American Falls Reservoir, offers chances at large brown, rainbow, and cutthroat trout. The lower reaches here also offer excellent smallmouth bass and carp fishing. If you have the right gear, chasing sturgeon also becomes possible. Focusing on trout, however, is a great approach to spring and fall in the region. Local expert Boots Allen has a reputation for landing big trout with consistency. His streamer game is excellent, and he points out that large, articulated streamers are very popular these days. Approach the lower reaches of the Henry’s Fork, South Fork and the Mainstem all the way to American Falls Reservoir with a predatory attitude during the shoulder seasons and through the winter months as well. While you can find numbers and have big days, show up ready to cast sink tips and large streamers in search of one or two really large fish. If you come prepared you might find the trout of a lifetime while fly fishing the Snake river. Written by Zach Lazzari for RootsRated Media in partnership with Yellowstone- Teton Territory. Thank you for visiting https://www.yellowstoneteton.org:443/Hunting_Down_the_Trout_of_a_Lifetime! Be sure and revisit yellowstoneteton.org frequently for content updates and more.